Balbo shifted from foot to foot uncomfortably. 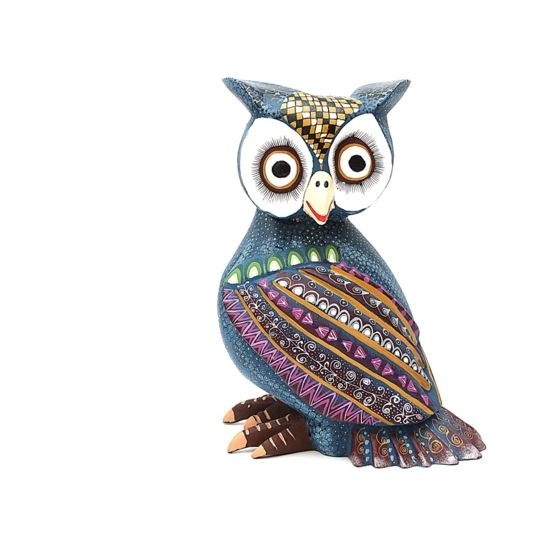 He looked at the other Oaxacan Screech Owls that had gathered to be with him. There were his good friends, Barbelo and Branko; several aunts and uncles; his mother and, of course, Bella. Bella was exactly what her name suggested - - beautiful! And, she loved Balbo. That’s why she had called this meeting, though Balbo did not yet know what she hoped to discover with everyone here. Glancing around and realizing that everyone she had invited was there, Bella opened the proceedings. There was no denying Belle’s statement. While the rest of the owls present may have had slight variations on the theme, they were all the typical color of Oaxacan Screech Owls. They all had the grayish facial disc with a prominent dark rim. Their eyes were yellow and their bill olive green with a yellow tip. Their bodies were grayish brown, and their claws dark horn with blackish tips. Balbo, on the other hand, was most different. His head was blue with gold dots, with a widow’s peak of alternating rows of diamonds of tan, gold and black. His body was the same blue and gold, and his wings, well they were something totally unique! Each wing had stripes of purple, brown and blue that were “decorated” with curlicues and Zapotec markings. His tail feathers were blue purple, with cold curlicues. The feathers were separated by rows of light-blue dots. Yes, Balbo certainly was blue! There was an awkward silence, and then Balbo’s mother, Brigidia, spoke. Again, Balbo assured them that was not the problem, either. “Then,” Bella said, her voice quivering, “is it because of me? Are you blue because of something I have said or done? Balbo knew that Bella’s emotions were about to manifest themselves as a flood of tears. Actually, he thought, he shouldn't have hid his problem from her for so long. Taking a deep breath he prepared to tell them the reason that he was blue - - a confession that he had hoped he would never have to make. You see, Balbo the screech owl was blue because he had lost his screech!